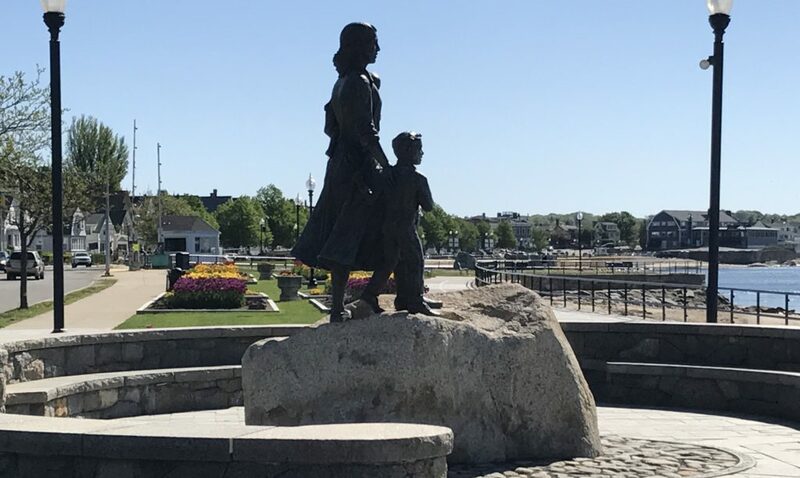 Also known as the Gloucester Fishermen’s Memorial, this iconic statue rests on a five-foot granite base located on the south side of Stacy Boulevard, at the edge of Gloucester Harbor. This eight-foot-tall statue shows a fisherman dressed in oilskins standing clenched at the wheel on the leaning deck of his ship. Positioned so that the fisherman is gazing out over Gloucester Harbor and sculpted with a rough finish to demonstrate the fisherman’s rugged appearance and impending danger. Sculpted by artist Leonard Craske and modeled after a local fisherman, the monument was completed in 1925 in honor of Gloucester’s 300th anniversary. The inscription at the base of the statue, from the Bible’s Psalm 107:23, reads: “They That Go Down to The Sea in Ships, 1623-1923”. Circling the monument are plaques with the names of those lost at sea from 1716–2001. Six of the most recent names on the tile are those of captain and crew from the Gloucester-based Andrea Gail, the fishing boat made famous in the book and film, The Perfect Storm. Further south on Stacy Boulevard, surrounded by gardens, is the Fishermen’s Wives Memorial. Also looking out to sea, this family group honors the patience and fortitude of families who even today anxiously await their loved ones’ safe return.